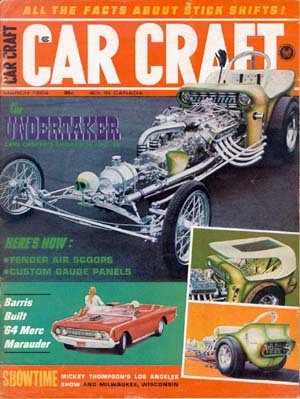 When Lincoln-Mercury stylist decided to try their hand at a sports car version of the '64 Merc Convertible, they called on Barris Kustom City for the building chores and wound up with one of the wildest "factory" customs ever to appear on the asphalt scene. Combining custom innovations with race car features, the new Merc has been dubbed "Super Marauder". It's wheelbase is five inches shorter and overall length eight inches shorter than the standard Merc. 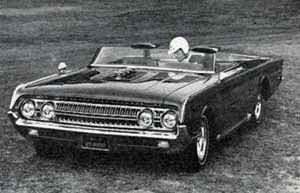 Built for two passengers, it has no top. 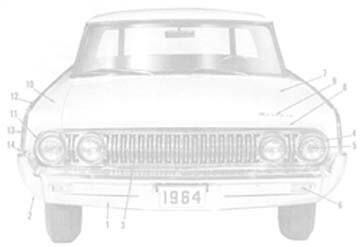 The windshield and side windows were patterned after Ford's experimental Mustang and were designed to eliminate the need for goggles at high speeds. Two futuristic headrests, located on filled-in deck area, are individually adjustable and contain rear turn signals. 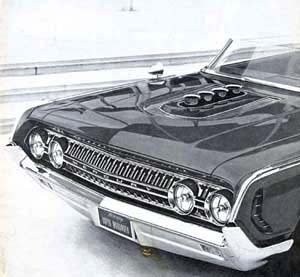 Velocity stacks were designed into the hood in order to accommodate a multi-carb system, not yet out of the drawingboard stage. Engine is a stock 427 incher. Two front fender intakes feed air to the breaks. 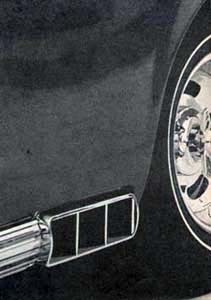 Exhaust exits through outlets located in stainless steel mouldings, just ahead of the rear wheels. The steering is two-handle type, utilizing conventional power steering. the exterior finish is "Golden Cinnabar," a bright Vermillion color.